In this article I will explain how to import the vCenter Linux Appliance and customize it with a fixed name and IP-address. When you build a vSphere environment from scratch and want to add a vCenter server into that environment one of the easiest ways is to import the Linux-based appliance. Importing the appliance from the vSphere Web Client would be the best choice because it allows for complete customization of the appliance when importing. (How to perform this task in the vSphere Web Client is explained here.) The vSphere Web Client is not available if you don't have vCenter so your first vCenter Appliance must be imported from the vSphere Client in Windows. 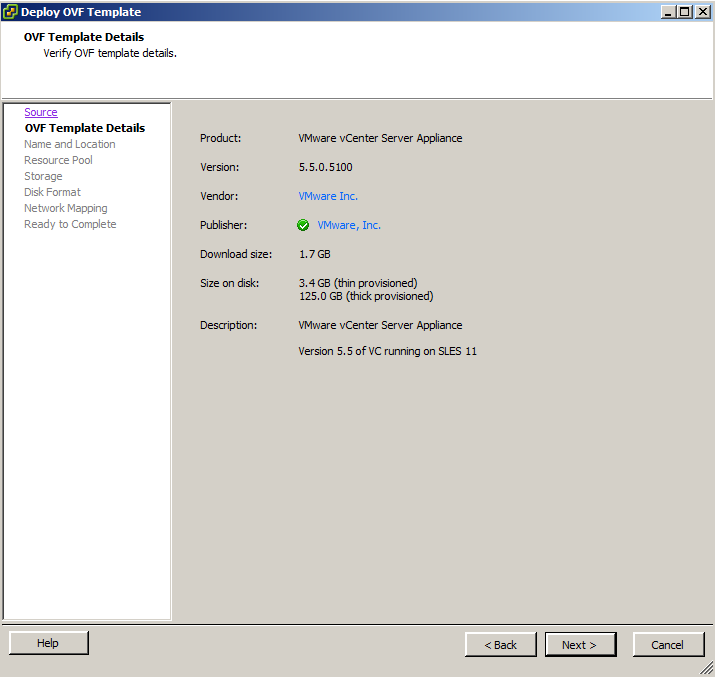 It is also possible to import the appliance from the command line with VMware's OVF Tool, which is available for Linux and Windows. How to do this is explained here. Prerequisites for this article are that you already have an ESXi-host installed, that you have installed the vSphere Client on your Windows-system and that you have downloaded the vCenter Linux Appliance. 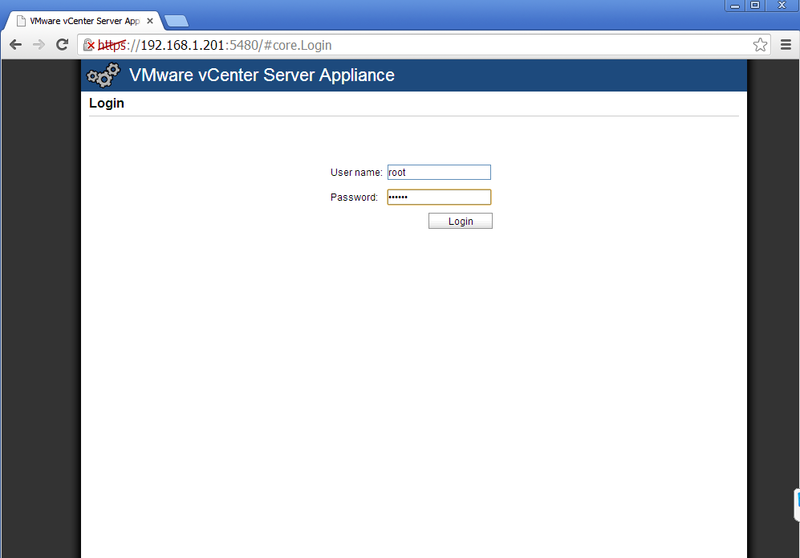 (http://www.vmware.com/go/download-vsphere) I also expect that you have DHCP in your network. Having DNS for the domain you are installing the host and vCenter into is also highly recommended. 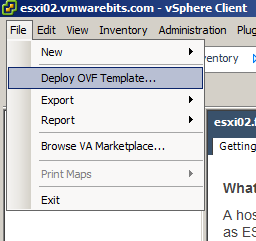 Login to the vSphere Client, select your ESXi-host from the Inventory and in the File-menu select the option Deploy OVF Template. 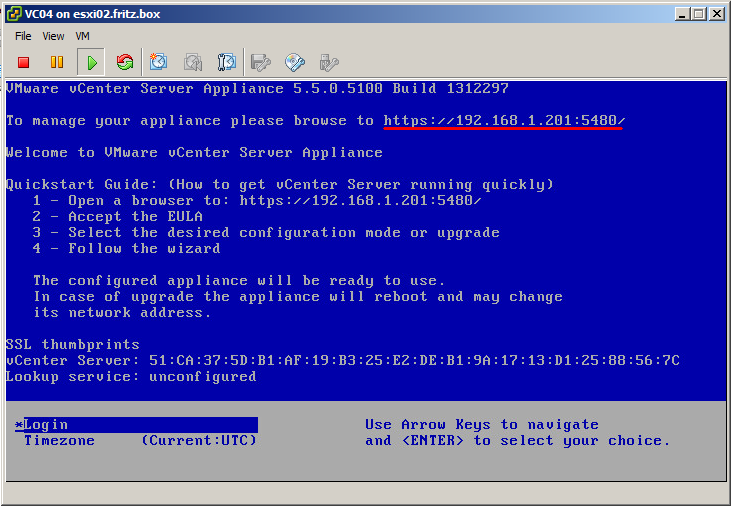 Browse to the vCenter Appliance files that you have downloaded to your computer. The wizard will display the details of the appliance, such as in the image below. Important to notice here is the disk size it will consume if imported in the thick provisioned format. If you do not want to pre-allocate, in this example, 125GB then later on in the wizard remember to select thin provisioning. After the virtual machine is successfully imported and powered on the vm's console will display information on which IP address to access the management web interface. In the image above it is http://192.168.1.201:5480. When you first login you must accept the License Agreement. 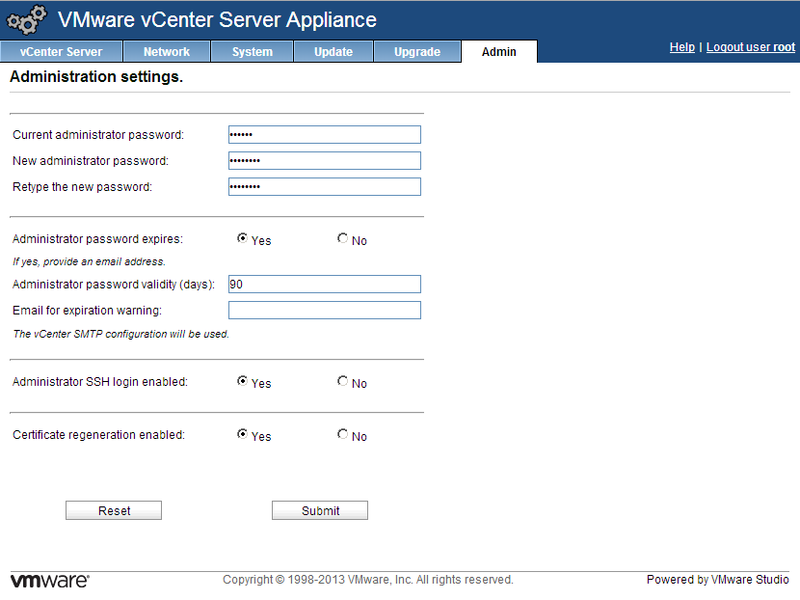 Next the vCenter Server Setup wizard will be started. DO NOT CONTINUE but cancel the wizard. If you continue the host will be named localhost and it will keep the dhcp-assigned IP-address. We want to run the vm with a configured hostname and a fixed IP-address. But we also want it to recreate the server's certificates with the new name and address and we want to configure our own root-password. After canceling the setup wizard go to the Admin-tab. Configure a new password and check the radio button Yes for the Certificate regeneration enabled. With the next reboot it will regenerate the certificates and this setting will be toggled to No afterwards. Also pay attention to the Password expiration policy, the default setting is to expire the password after 90 days. 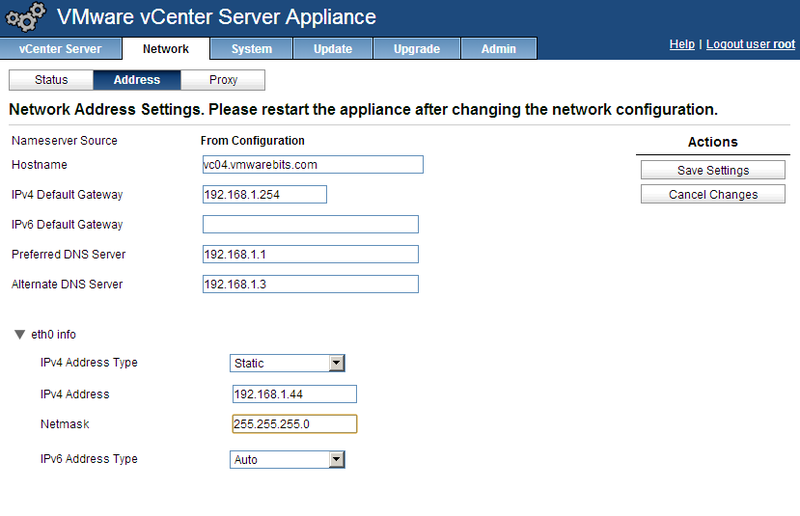 Next access the Network-tab and go to the Address configuration to change the IPv4 Address Type from DHCP to Fixed. Very important is to provide a FQDN for the hostname if you ever plan to add this host to Active Directory. Only providing a host name such as VC02 wouldn't work, VC02.YOURDOMAIN.COM would work. 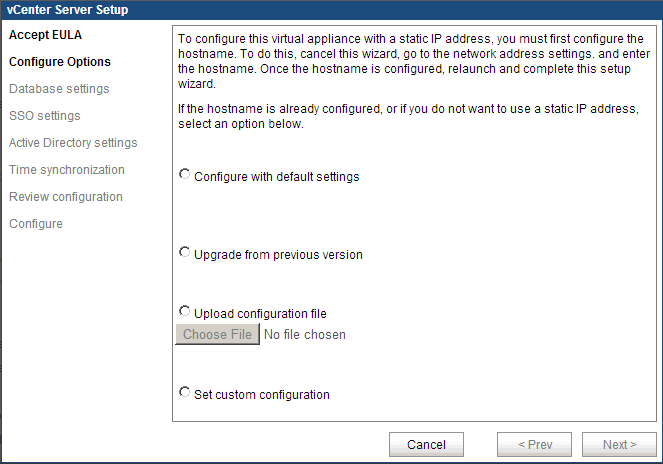 After configuring the new IP address and the host name restart the appliance. 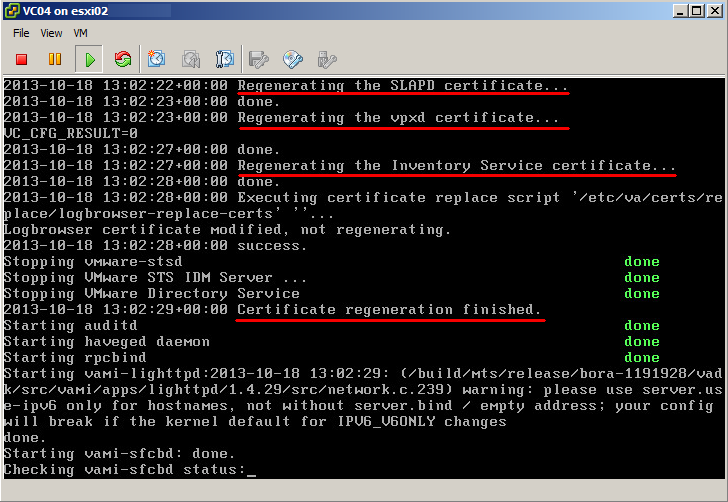 During the reboot watch the virtual machine console, you will see messages about the certificate regeneration process. When the machine is booted the screen should display the new IP address as the management address. 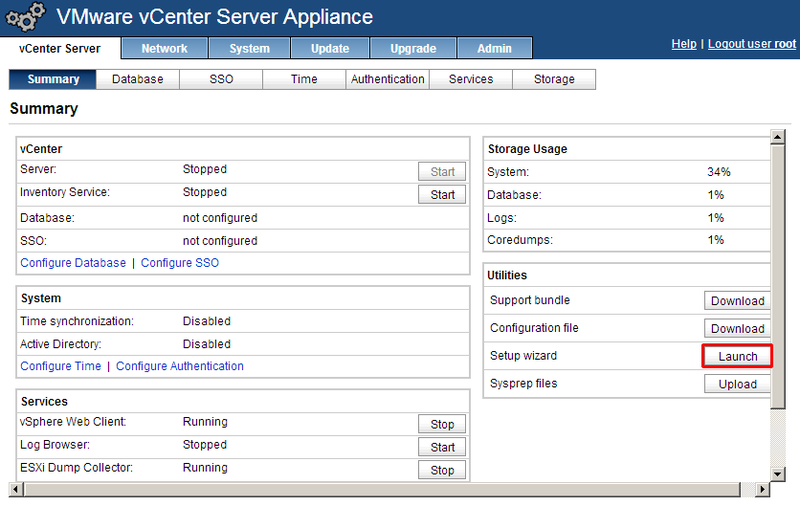 Access the web administration portal again to start the Setup wizard. The launch button for the wizard is located on the right under Utilities. 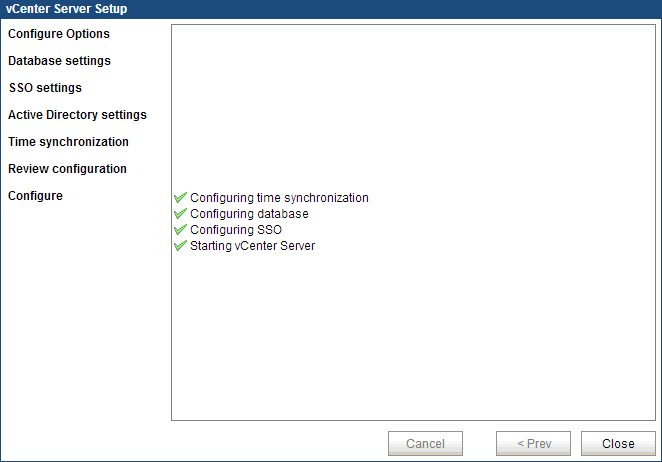 In the wizard if this is your first vCenter server and you do not need to configure anything specific for Single SignOn then choose Configure with default settings. It will create an embedded database and setup Single SignOn with default parameters. Click Start to let the wizard configure your server. At this time there is no need to add vCenter to Active Directory because if you have AD it is better to add that as an identity source once your vCenter server is ready. This is described at the end of this article. Let the machine work for five to ten minutes and your vCenter server will be ready to run. The next step would be to add a license to your vCenter server or leave it running with the evaluation license for 60 days. 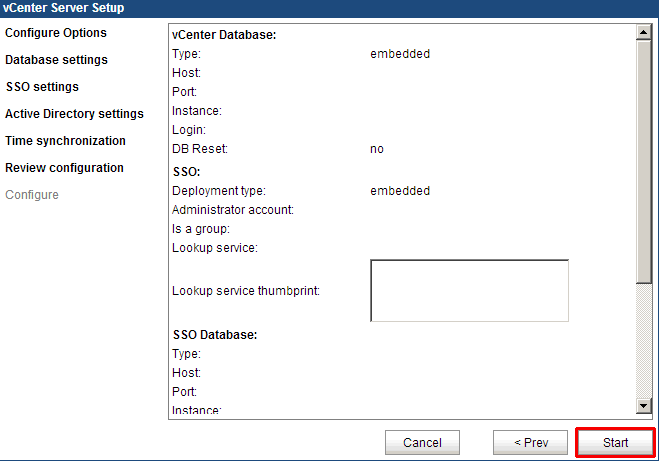 After that create a datacenter object and add your ESXi-host to your inventory.